Kelly and went to the Kromdraai Lion and Nature Reserve, which is around an hour away from Sandton, to the north west of the city. It is a privately owned reserve covering around 1,400 hectares and opened to the public in 1990. It has two main areas, each of which one drives through in ones own car. The first, and larger area has a variety of wild animals in it, and we saw Springboks, Waterbucks, Zebras (including a calf), a Warthog family, Ostriches, a herd of Wildebeest (not sure if blue or black), what we think was a yellow Mongoose (it was running really fast!) and blue cranes in their natural habitat. 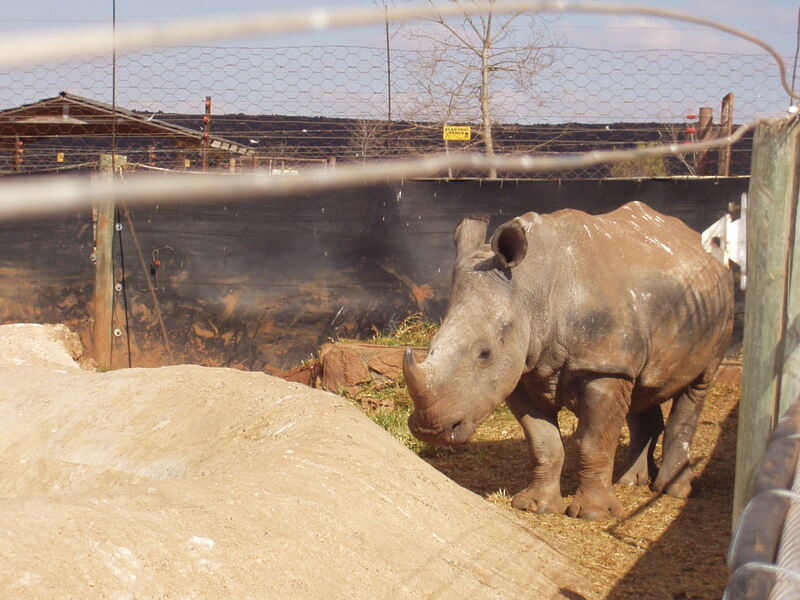 They also have a nursery there with young of a number of animals. So we saw a baby rhino, which looks very much the same as an adult, just smaller, not really cute. There were mottled wild dog pups and some lion cubs. 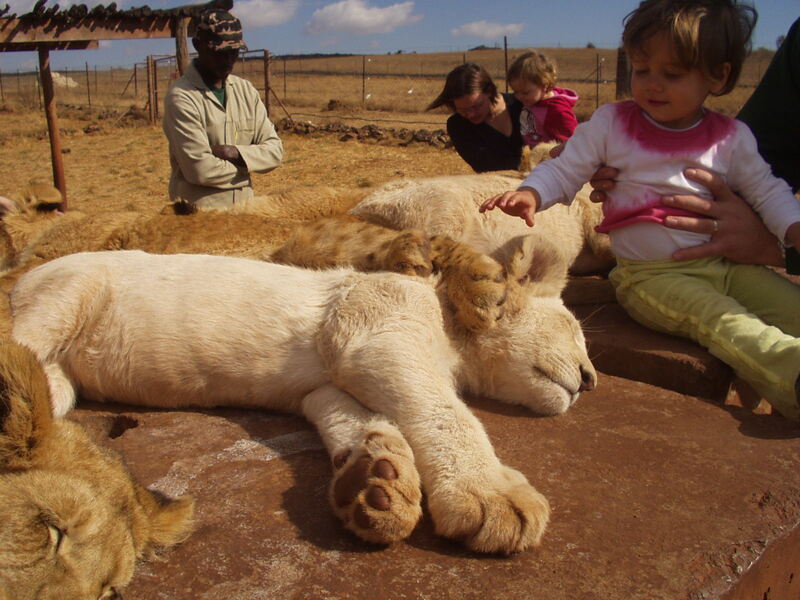 We were able to go and ‘play’ with the lion cubs although they were actually not that bothered about us and basically sleeping in the sun. I was surprised how coarse their pelt is, I had sort of been expecting them to be soft and fluffy, but their fur is very rough! A couple of them are white lion cubs. White lions are a separate colouring of lions rather than albinos. Albinos have red eyes whereas white lions have blue eyes. It is a recessive gene and there a couple of white lions at the reserve which are kept separate from other lions so that they breed further white lions rather than interbreeding with others. There are no white lions in the wild anymore, all living ones are in captivity. There is also a separate area which is fenced off for the predatory animals. They live separate from each other in large areas of land. 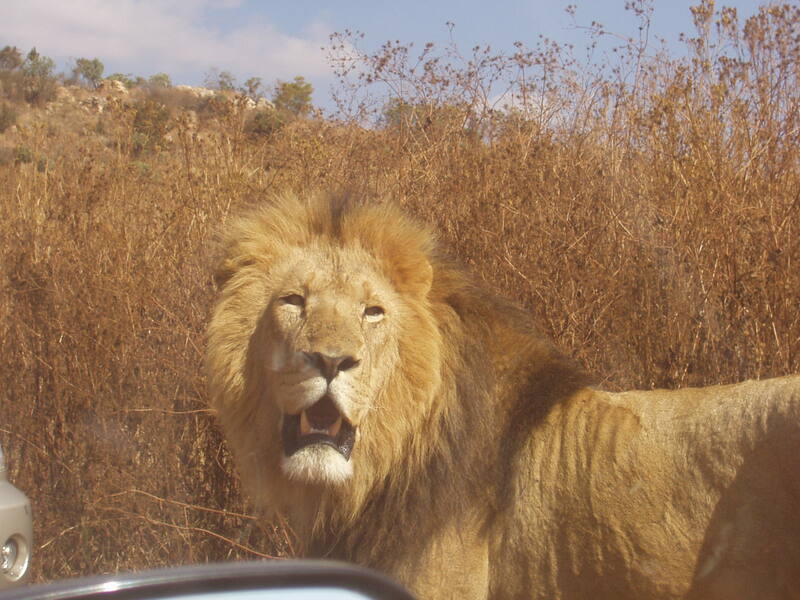 Throughout the whole park, you are told not leave your vehicle apart from the visitors’ centre (where the nursery is), in the predator area, the warning goes further, never switch your engine off, always be prepared to drive off and don’t open windows further than 33%. When we got to the gate for this area, it seemed a little staged, around 6 adult lions (3 male, 3 female) were lying by the gate to be seen as soon as we entered the area. 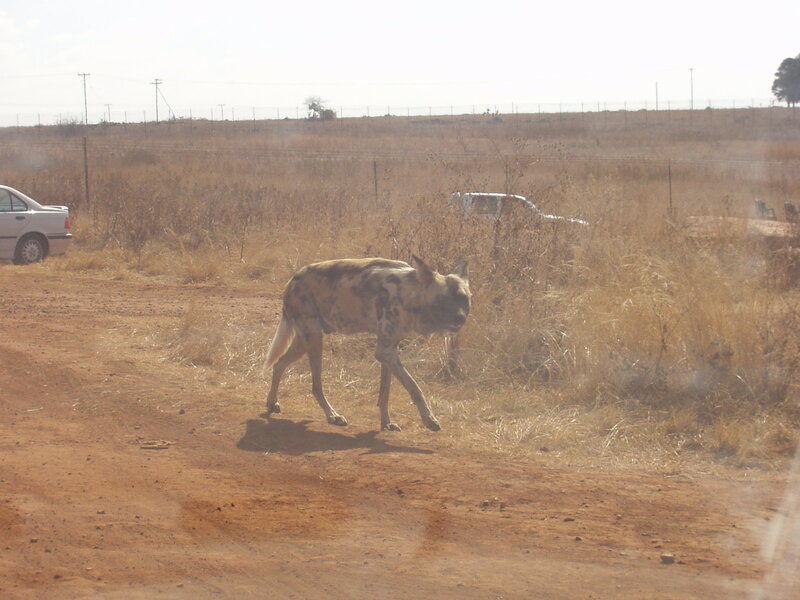 After we had past them, we carried on through their enclosure and on to the section reserved for the wild dogs. In each of the predator areas, there are feeding places, these animals are adequately fed not to want to hunt, and are fed once a day. Although we had been told they were due to be fed at 3pm, when we got to the wild dogs at around 1pm we suspected they had just been fed. A pack was around the feeding area and one of the dogs was definitely still eating. It meant that we could have a good look at them. They are quite canine looking in the pet sense, however have far more rounded ears than most domesticated dog breeds. They are also very mottled and it is clear how they stay undetected while hunting. Having seen the dogs, we went on to the cheetah area. We did see two cheetahs, they were in enclosures though, separated from each other, she we aren’t quite sure whether there is a bigger group that just stayed hidden or whether these were the only two there at the time. Why they were segregated off is also unclear. 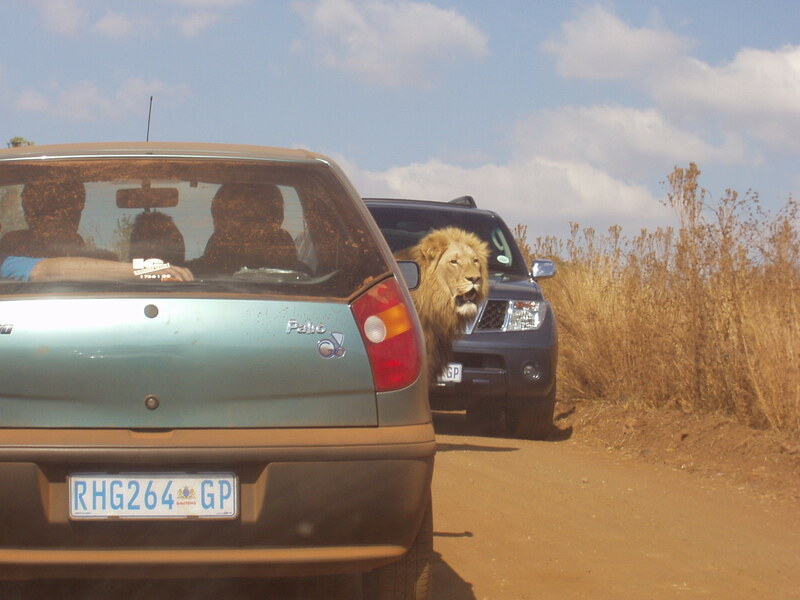 On our way back to the ‘non-predator’ area, we had to pass back through the lion section. We could see from the top of a hill we were passing over that there was what looked like a traffic jam on the exit road. We discussed whether we should go around a different way first, then realised why the traffic jam was there. 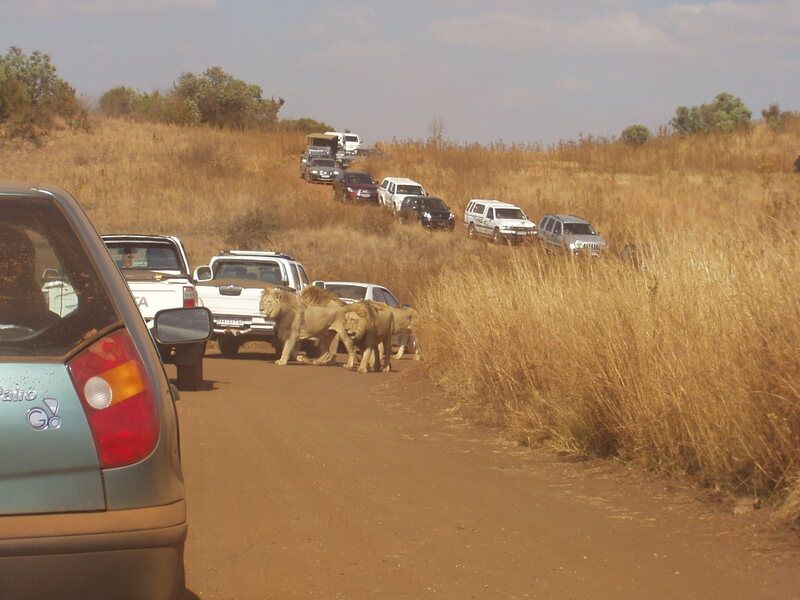 It was a traffic jam Africa style – caused by the pride of lions wandering around the road! So we decided to brave it and join the end of the jam. 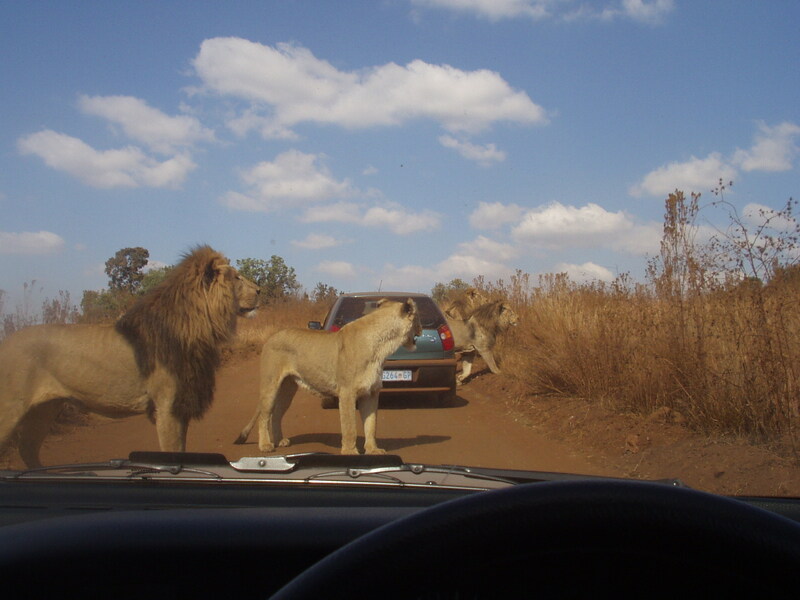 The lions were just wandering around the road, meaning that cars could only pass at intervals. Kelly had her window open a little and I asked her to close it. I was perhaps more nervous than needed, but I would rather be safe than sorry. 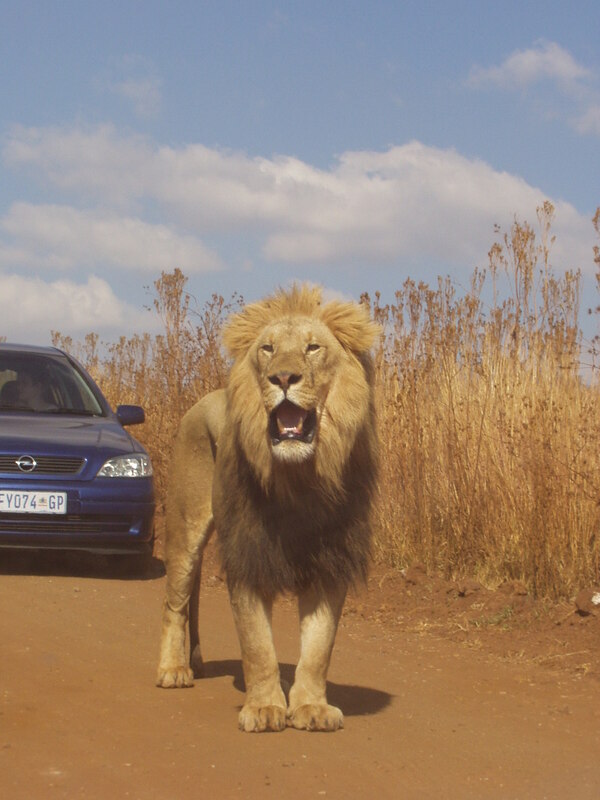 As she was closing it, one of the lions walked past us on my side. A couple of minutes later, it had obviously turned around and then walked back on her side of the car, far closer, practically brushing the side of the car as it walked past. It made us both jump a little and glad that the window was closed. They were actually just wandering around and with hindsight, I doubt whether having a window open a little would have made a difference, an arm trailing down the side of the car may have done so though! At the gate to the predator area there are loos and Kelly and I both decided to make use of the facilities. At the side of the building was a family of warthogs, busy digging up the ground and eating roots. 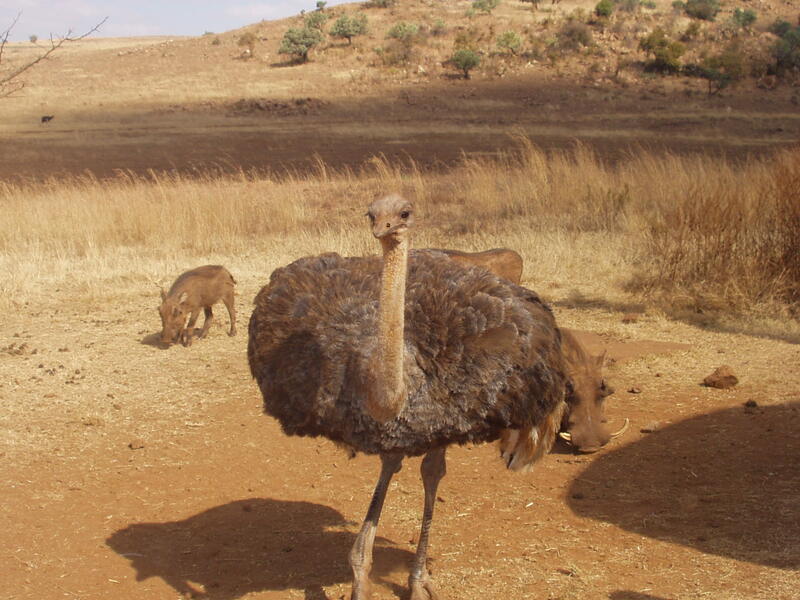 There was also an ostrich there, so I decided to take a close up picture of it as it was walking away from me. It then decided to turn around and started walking straight towards me. 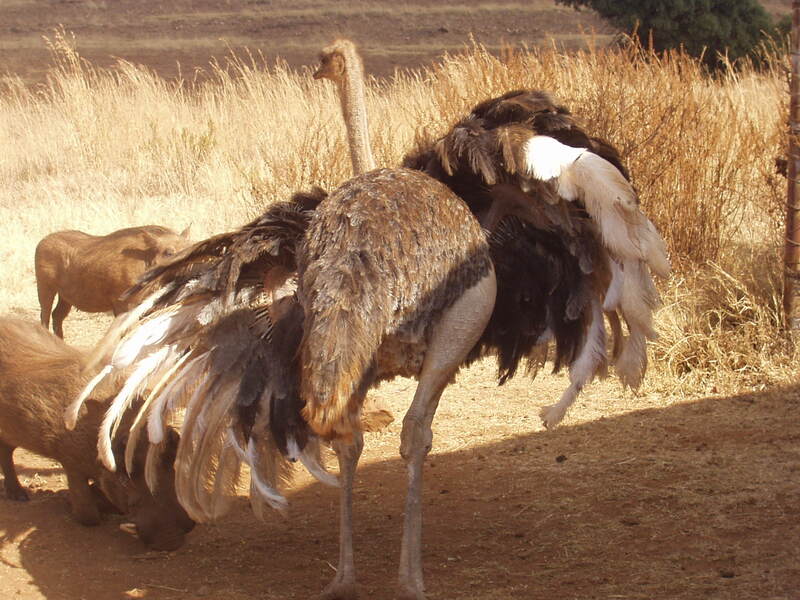 I was rather unnerved, as I had heard that ostriches can be quite dangerous if they attack you. Remembering what I was always told as a child about dogs, I just stayed still, (took another picture though, without zoom) and it walked straight past me. Goodness knows what would have happened had the adrenaline got me to into ‘flight’ mode and I’d have run. I’m sure my mother never considered the danger of ostriches when she taught me not to run away from animals, it was valuable advice at that moment though! Having driven around the whole reserve, we then visited their separate breeding centre. This is where we saw the adult white lions, some Siberian tigers, Bengal tigers, jaguars and hippos. They all live in large enclosures, a couple in each enclosure. As the white lion cubs had made it to the nursery section so had two white tiger cubs (not that I saw any adult white tigers) I presume that if any of these couples were to reproduce, their cubs would be in the nursery section once weaned. A visit at some other time may therefore yield far more young wild cats! The hippo ponds are also around that area, and the hippos were sitting in the sun at the side of the pond rather than lounging in it. They really reminded me of the Happy Hippos animated characters which advertise the chocolate bars in Europe, although obviously none of them were wearing skirts or dancing. The cartoons do capture the general shape of real hippos really well though. Lots of animals in one day – a number of my colleagues here were surprised that we saw so many of them in a day, when they have spent 2 – 3 days on game drives in the Kruger park not to have seen a single big cat.